Autogeek Half Gallon Foam Gun FREE BONUS! Home > Shop By Brand > Foam Wash Gun > Autogeek Half Gallon Foam Gun FREE BONUS! For a limited time only, receive a BLACKFIRE Foam Soap sample FREE with your purchase! This is the only foam gun to receive our seal of approval! The Autogeek staff was so impressed with the Foamaster Foam Wash Gun, we worked with the manufacturer to create a special version just for Autogeek. The Autogeek Foamaster is a heavy duty foam gun with brass fittings and a handle and nozzle in our signature colors, red and black. The gun has all the quality and performance you expect from Autogeek plus the assurance of a gentle, sudsy wash. If you're a detailer in search of the perfect swirl-free car washing technique (aren't we all? ), then you've come to the right place. My staff and I are constantly reading up on the internet and consulting detailers to see what new tools and techniques are out there. Our latest find is the Foamaster Foam Cleaning Gun. 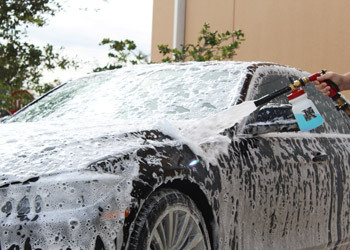 The idea behind a foam gun is to minimize the amount of rubbing and scrubbing necessary to clean the vehicle by pre-soaking it with frothy foam.The foam starts loosening and lubricating the paint immediately. As you work your way down and around the vehicle with a mitt or sponge, you don't have to use as much force to remove dirt and debris. It's already loose and just needs slight agitation to release it from the paint surface. This gentle touch substantially decreases the risk of micro-marring because the paint is covered in a foamy layer of lubrication. Used in combination with a premium car shampoo, the Foamaster is a guaranteed safe way to wash your vehicle. We compared several guns and found that the Foamaster is the best for car washing. 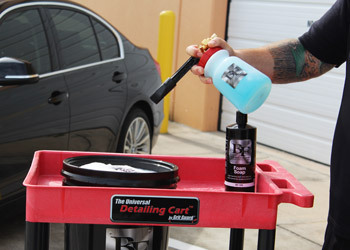 It creates a substantial amount of foam by forcing water through the nozzle where it mixes with the diluted car shampoo that is in the gun's reservoir. The foam is richer, thicker, and sticks to the vehicle longer than soap applied by hand because the dilution ratio of the soap is higher. Many detailers we talked to use the Foamaster as they wash with a mitt or sponge, instead of as a pre-soak, or sometimes in addition to a pre-soak. This technique involves spraying the foam directly in your mitt's path. The foam is its frothiest upon contact so this method ensures a thick, sudsy layer of foam between the mitt and the paint surface. If you use this technique, just take care to avoid hitting the nozzle on the paint as you disperse the foam. Since you're using both hands, this takes a little coordination. Practice makes perfect! For best results, pour approximately 2 oz. 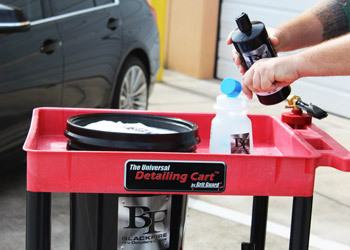 of BLACKFIRE Foam Soap into the canister. Disconnect the hose nozzle from the foam gun and fill the canister with 6-8 oz. of water. The Foamaster's nozzle is constructed of brass, giving it excellent, long-lasting performance and durability. The handle, foaming tip, and reservoir lid are all made of heavy duty plastic, and the reservoir itself is chemical resistant polyethylene. This industrial grade foam gun is used by more detailers and enthusiasts because it's built to last. 75QCFMR – Quart Foam Gun w/ multi-ratio stem and deflector. 75HGFMR – Half Gallon Foam Gun w/ multi-ratio stem and deflector. Multi-ratio Stem - The multi-ratio stem gives you five settings so you can adjust the dilution ratio of your shampoo. The chart below shows you the shampoo (oz.) to water (gal.) ratio based on the position of the stem. To get extreme foam, shake the canister and mixture well. Be sure to shake occasionally during use. 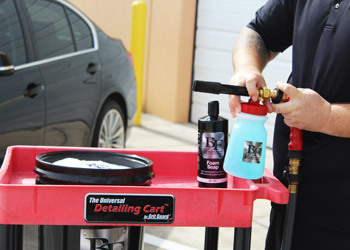 Use the quick connect to easily detach foam gun from hose, making it fast and easy to rinse the vehicle. Deflector - This piece can be used instead of the foam nozzle to deflect exiting water downward and into a wider path. 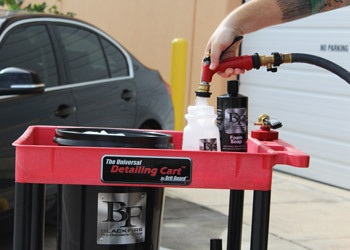 This piece is best suited for spraying non-foaming cleaners over a broad area. *If you are going to use the Foamaster on your vehicle, use it exclusively for your vehicle to avoid cross contamination. Spray Pattern - Foaming attachment provides a fan spray, removes for a solid stream. Deflectors are available for fan spray patterns for non-foaming chemicals. The Foamaster Foam Gun will give you a foamy layer of lubrication on your vehicle's surface, creating a safe way to wash your vehicle! We recommend using BLACKFIRE Foam Soap in the Foamaster Foam Wash Gun. This shampoo is super-sudsy when used in a bucket; just imagine how much foam it produces when distributed with a foam gun! As always, use a paint-safe wash tool such as a Pinnacle Chenille Wash Sponge or a Sheepskin Wash Mitt. After each use, rinse the nozzle and foaming mechanism with clean water to remove any soap residue. This will prevent soapy build-up inside the nozzle and on the brass mechanisms. With regular cleaning, the Foamaster will give you years of trouble-free performance. The Foamaster Foam Wash Gun has the features you want and the durable construction you need. 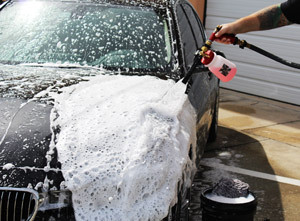 Protect your vehicle from micro-marring and wash-induced scratches with the Foamaster! If you own a pressure washer, check out the Foam Cannon HP. It generates foam at a higher pressure to maximize cleaning power. BLACKFIRE Foam Booster 16 oz. BLACKFIRE Foam Soap 32 oz. At first it's like yeah whatever. It's foam but let me try. And glad I did. Save so much time and money. I use an RV filter connected to the hose to ensure good foam. You really need to use filtered water in order to get good foaming action. I use to sell water filters. So for whoever reads this, LEARN! If you buy any foam gun and you don't get foam then the problem will most likely be the hardness in your water. You don't need an entire whole house filter. A simple RV filter with carbon media at Wal-Mart will do and it connects to any standard hose. If with that it doesn't foam then it could be the gun. But I doubt it. It's usually going to be the quality of your water. ProsGreat foaming action when used with a water filter. Really helps make the job faster than the two bucket wash method. ConsI don't like the warning may cause cancer due to the brass fittings. So wear gloves. The foam cannon works it shoots out foam! ProsThe canon works and makes foam. It is easy to handle as long as you don't have to lift it over your head. ConsThe foam density is a bit disappointing and the canon difficult for me to hold over my head to foam the roof of my van.